Sunlight Dishwashing Liquid is celebrating the launch of its new 100% recycled and recyclable bottle. 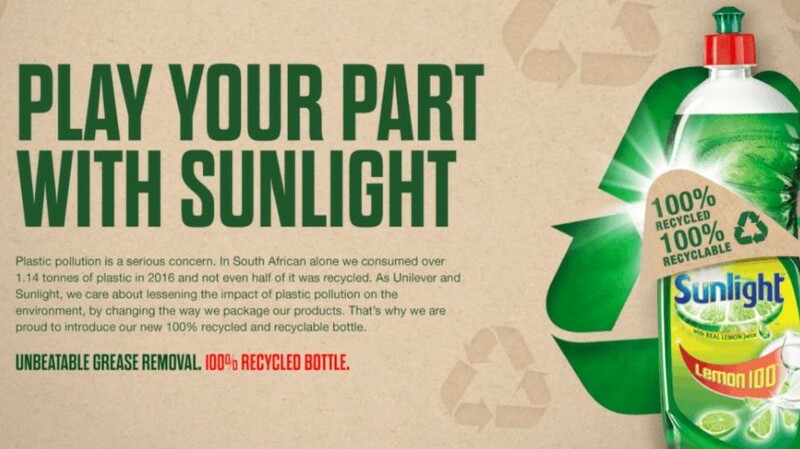 The innovation on its 750ml and 400ml bottles marks a key milestone for the South African household brand, and Unilever’s ambition to reduce its overall environmental impact by half by 2030. According to Plastics South Africa, in 2016 the country accumulated over 1.14 million tonnes of plastic waste and less than half of it was recycled. With its volume of products in the market, Unilever says it felt the duty to act. In 2010, the Unilever Sustainable Living Plan was launched to accelerate efforts towards a more circular economy. In 2017, Unilever committed to ensuring that 100% of plastic packaging will be designed to be fully reusable, recyclable or compostable by 2030. By 2011, partnering with Extrupet, Serioplast and PETCO (the PET Plastic Recycling Company), the team began researching how to achieve their now 100% recycled 750ml and 400ml bottle packaging. “The benefits of a project like this are substantial. They’re environmentally beneficial, they’re socially beneficial and, of course, they economically beneficial,” says Cheri Scholtz, PETCO CEO. Beyond reducing its own footprint, the dishwashing liquid aims to inspire and challenge consumers to play their part and adopt more sustainable habits by recycling and using more sustainability-focussed brands — like Sunlight. Cape Town joined the cause on Monday, 18 March (Global Recycling Day), when the view through the yellow frame at the V&A Waterfront was transformed into a plastic waste image of Table Mountain. According to Sunlight, the effect stopped locals and tourists in their tracks, forcing them to think twice about the impact of their behaviours on our natural wonders. The visual tactic aimed to act as an awareness tool, while also driving the message: “Play your part. Recycle your Plastic”. The brand now challenges the public to initiate change with a pledge. The ‘#SunlightPlayYourPart’ challenge aims to steer behaviour towards the circular economy of recycling. Individuals can pledge their commitment to recycling plastic by visiting http://bit.ly/Sunlight2019. Sunlight Dishwashing Liquid has donated R10 000 to the Oasis Association, which aims to uplift those with learning disabilities by providing job opportunities and skills development at recycling centres across the country. 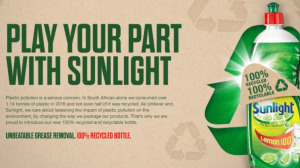 The brand has promised to double its donation if 10 000 South Africans make the ‘#SunlightPlayYourPart’ pledge. For more information, visit www.sunlight.co.za. You can also follow Sunlight Dishwashing Liquid on Facebook or on Twitter.